Dex increases your action speed. 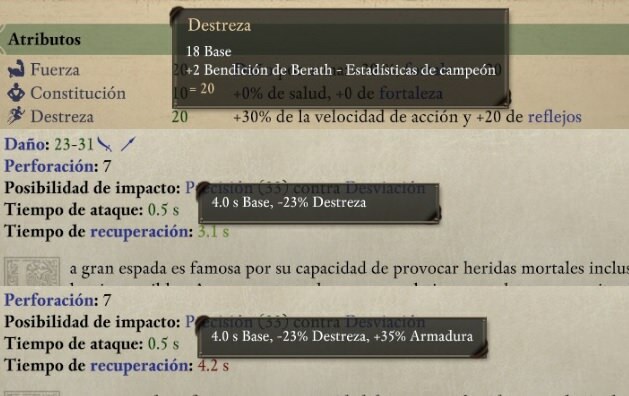 While the tooltip displays action time decrease. Edited by judgebeo, 04 December 2018 - 03:41 AM. I think this is simply the difference between "bonus action speed" and "reduced recovery". If you went twice as fast (+100% action speed), your recovery time would be 50% less. Similarly, if you go 30% faster, your recovery time is 100*(1-1/1.3) = 23% less. Sorry, didn't notice before... thanks for the answer. ranger which armor and best "overall" weapon ?